Bulk SMS software for USB modem is mobile marketing solution that helps you to increase your sales via broadcasting bulk messages with the help of USB phone modem connected to PC. 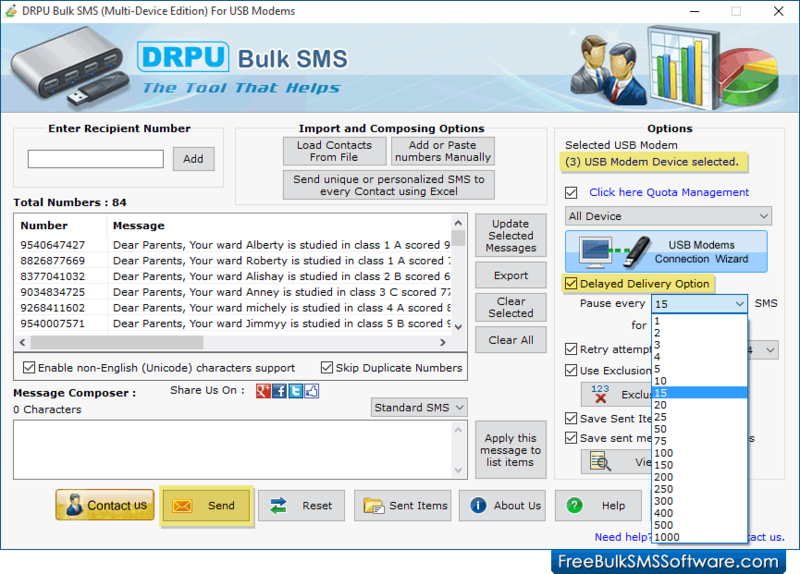 Bulk text messaging software allows you to connect multiple numbers of USB modems with computer or laptop device by sending sms for free. Bulk SMS Software for USB modems supports all unicode characters to send text messages in any language. Software has option to skip duplicate numbers at the time of sending SMS. No internet connection is required to send sms from modem using sms gateway software. Text sms sender software provides facility to send notifications or standard SMS. Gateway sms software allows user to control load of bulk SMS broadcasting using delayed delivery option. Gateways sms sending program provides inbuilt list wizard option helps to maintain the list of contacts or groups which may require while sending free sms from PC to mobile phones. Sent bulksms text messages can be saved and viewed by the users. SMS modem gateway software easily works on entire types of USB to send free sms text messages in bulk numbers. Start business marketing through bulk SMS software! Streamline your business marketing and enhance customers interaction. Communicate with targeted audience via broadcasting bulkSMS. Provides business products updates and new offers details to the customers. Drive targeted customers to your business and increase business revenue and sales by sending free sms.